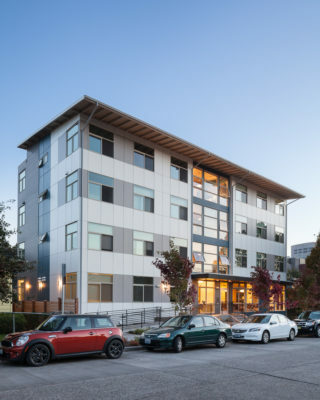 ALCOVA has been making its mark on the face of residential architecture in Seattle since 2010, when AIA member and LEED-certified owner Pietro Potesta decided to bring artistic integrity and custom sustainable design together to form a new firm. Potesta received his Master of Architecture and Urban Planning from Milan Politecnico. He works with architectural designer Richard Tung, who graduated from The Washington State University with a Master in Architecture. ALCOVA prides themselves on their ability to provide clients with complete design services, including feasibility studies, master planning, site planning, site design, landscape design, architectural services, and interior and lighting design. ALCOVA was featured on Houzz 10k saves 2016, and they are sure to gain more recognition for their aesthetic sensibility and environmental sensitivity as they grow their voice in the Northwest. What is known as the Queen Anne House weaves bold, beautiful design into a viewfinder’s paradise. Perched on a steep slope, the 5,000-square-foot residence is privy to sweeping lookouts on Lake Union and downtown Seattle. To take full advantage of available views, the design integrates openness and privacy, crafting public spots as well as secluded ones, through the use of well-placed balconies. This stunner includes a black iron staircase railing and open staircase design, as well as enormous windows that stretch all the way to the upper story. The Magnolia House, situated in a core Seattle neighborhood, combines artistic flair and sleek sophistication, not to mention numerous green design features, including southern exposure glazing, oriented overhangs, and bioretention cells. The garage roof doubles as a deck, an upper balcony provides sweet neighborhood views, and natural light is welcomed in through the use of window walls. Stephenson Design Collective has been crafting modern, progressive residential structures since 2009, when Ryan Stephenson founded the firm that is known for their clean and balanced style. Stephenson received a professional degree in architecture with honors from Auburn University and the Rural Studio Design Build thesis program. His associate, Kelly Mcconnaha, earned her Master of Architecture from the University of Virginia and her B.A. in Fine Arts and Art History from the University of Iowa. Aside from single-family residential, the firm has also worked on multi-family structures, as well as multi-use projects in the greater Seattle area. Stephenson Design seeks to identify its client’s lifestyle requirements, in order to envision spaces that meet the client’s daily needs. While still making a name for themselves in the national architecture scene, their residential portfolio is impressive, in both breadth and stylistic versatility. The Lark residence uses a pleasing interplay of square and rectangular modules, exterior and interior wood paneling, full glass patio doors, ample windows, and can lights to provide a perfect pairing of cozy rustic and clean contemporary. Highlights include an adorable wood paneled desk nook off the kitchen, three walls of windows in the master bedroom, and an outdoor stone, rectangular firepit. The Z-house is the result of Stephenson Design Collective’s effective collaboration with clients who had a clear vision. The group aim was to create a home with zero wasted space. Twelve-foot ceilings give a sense of grandeur. Other wonderful features include a private courtyard with heated concrete floors, full glass doors, skylights, and an overall aesthetic that is clean and bright. Seattle native John DeForest earned architectural degrees from Harvard and Yale University’s Graduate School of Design. DeForest Architects was the result of his vision to nurture a collaborative approach in the design process. DeForest also operates a California studio, managed by AIA member Brett Smith, who received his Master of Architecture from the University of Washington. Their residential work has been featured in Luxe Magazine and Residential Design, and they’ve been listed on the Best of Houzz 2017 for Design and 2018 for Service. It is the firm’s goal to be in touch with their client’s core values. Their office is centered around their workflow process and includes a 12-foot kitchen table for creative brainstorming sessions between clients and colleagues. Featured in Seattle Metropolitan Magazine, The ‘Zipper’ House is the revisioning of a postwar split-level. Opening up the stairs, raising the roof, and creating a fifth level allowed the space to integrate grand views with functional habitation. The skylights, second-level indoor balcony, wood-paneled bathroom wall that doubles as the bed backdrop, and a gorgeous raised patio make this home unique, light-filled, modern and style progressive. The Gallery House was intended to complement the client’s Northwest art collection, take advantage of Sound and Olympic Mountain views, and seize outdoor viewing opportunities for morning light and evening sunsets. DeForest managed to pull all of this off in a chic, cutting-edge, urban design that includes upper-floor shared decks, a central steel and glass staircase that acts as a vertical gallery, and wood paneled ceilings. Lane Williams Architecture is a small, effective team that focuses on custom, single-family residences. Firm founder and AIA member Lane Williams has received 20 awards for his home design, which include three AIA/Seattle Times Home of the Year awards. Their motto is “Architecture for Living,” which encompasses their dedication to creating durability, comfort, and sustainability in equal measure. The firm’s standout work has been featured in Seattle Homes & Lifestyles, Pacific Magazine, Northwest Home and Garden, and Trends Magazine. The firm’s remodeling experience is stylistically versatile, including Mid-century modern homes by renowned Northwest architects. They have left their design mark on Washington, Oregon, California, MIchigan, and Connecticut. In the concentrated neighborhood of Seattle’s Queen Anne Hill, Lane Williams constructed a contemporary, hip 2,800-square-foot residence with the use of a basic box envelope and large window bays that invite substantial natural light. The residence includes a second-floor bedroom that cantilevers to offer weather protection for the deck below, a basement playroom, a guest suite, and a garage. Some standout stylistic elements are the wood paneled wall with an adjacent, modern corner fireplace and a beautiful, mixed-material kitchen island. The residence on Bainbridge Island is not only mere steps from the beach, but it also has enough natural interior beauty to make you seriously reconsider going outside. This 3,100-square-foot structure makes good use of sustainable, rugged materials, such a reclaimed wood staircase and recycled glass and concrete counters, providing an outdoorsy yet worldly visual appeal. The iron railing, exposed wood ceiling beams, ample outdoor sitting space, adjacent his-and-hers arts studios, and detached garage make this spot a dream residence that truly balances a live, work, and play design. Neiman Taber Architects consider livability and affordability to be the foundations of their design practice. The firm involves itself with public policy surrounding housing issues and considers themselves advocates for accessible housing. The practice was founded by David Neiman in 2000, and he is known for his attentiveness to homes that are authentic to their time and place, bringing his knowledge of the Pacific Northwest’s climate into his design vision for adaptable houses that integrate well with their surroundings. David Taber moved to Seattle in 2012 and joined forces with Neiman, creating the official brand of Neiman Taber Architects in 2013. Taber received his Master of Architecture from the University of Pennsylvania. The firm’s work has been recognized in Northwest Home Magazine, Seattle Magazine, the Daily Journal of Commerce, The Seattle Times and the New York Sunday Times Magazine. 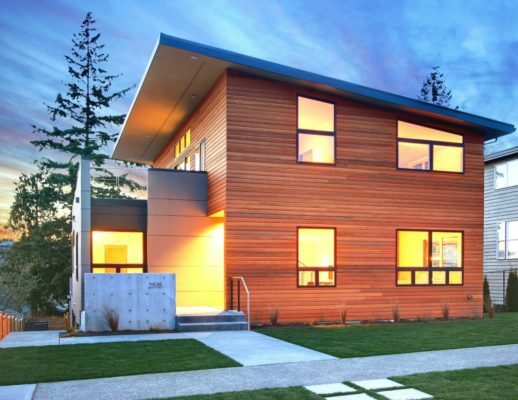 They’ve received the PSRC Vision 2040 Award, the EcoGuild NW Green Home Tour: Visitor’s Favorite Award, the AIA Home of the Month Award, and the AIA Explore Design Tour Award. The Walsh Hollon residence showcases a versatile array of energy-saving technologies, including high-performance windows, heat recovery ventilation, and a geothermal heat pump. Oversized, operable windows let in tons of daylight, and cement board, rain screen siding provides a dependable exterior envelope. This home is all about sustainability fused with beauty — with an elegant glass canopy over the deck, a green roof over the garage, and a sweet, front facing upper-floor balcony. The Pratt residence pays homage to the grace of a well-executed addition that complements the original character of a pre-existing structure, seamlessly. The loft addition to this modest WWII-era home includes a master suite, a layered shed roof, and a new stair tower. The corrugated metal siding, open wooden stairs, long windows, and contemporary bathroom adds sass, sophistication, and elegance to the space. 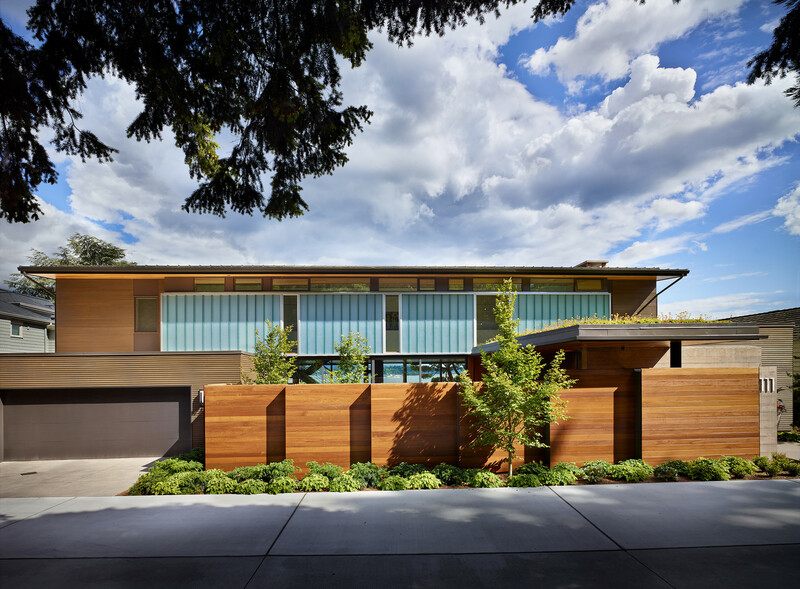 David Vandervort Architects was founded in 1994 and has their office in the Eastlake neighborhood of Seattle. The firm values the inspiration and influence provided by the majestic Northwest and attempts to integrate this influence into their work, alongside design solutions that are considerate to the land and the environmental needs of the area. AIA member and founder David Vandervort graduated with his Bachelor of Arts in Architecture from the University of Washington and is a member of the American Institute of Architects. The firm’s work has been featured in Dwell Magazine, Eco Home Blog, the Daily Journal of Commerce, Northwest Magazine, Sunset Magazine and Votre Maison Magazine. They’ve been named Firm of the Year by Seattle Magazine, were a 2013 Built Green Conference Award Winner, and won the Eco Design Merit Award and the AIA Seattle Times Home of the Month Award. David Vandervort Architects’ residence in Seattle’s Magnolia neighborhood is 1,765 square feet and seamlessly integrates contrasting design concepts. Where a fire destroyed a previous residence, a gable structure covered in corrugated metal siding attaches to an adjacent structure covered with red, cement board siding and a fir curtain window wall. The result isn’t just handsome, it’s environmentally sensitive in approach — including high-efficiency glazing, formaldehyde-free insulation, and a construction process that took recycling and the availability of local resources into account. Salvaged lumber, Medite flooring, natural finishes, and Energy Star-rated appliances make this structure highly functional, while high slanted ceilings, exposed wood beams, and an open floor plan create a natural sense of ease and comfort. 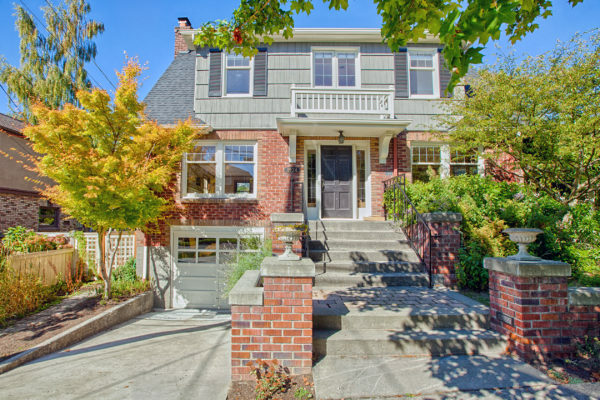 The Montlake remodel expanded an existing modern craftsman to encompass 3,400 square feet. A new family space that flows into a garden patio, large bedroom skylights, nontoxic finishes, a rainwater collection system, and an upper deck are just some of the standouts that give this residence traditional charm, modern ease, and a woodsy appeal. Prentiss + Balance + Wickline is the result of different firms coming together to unite their vision of a balance between natural and built environments and between beauty and utility. Their work is innovative, while remaining deeply rooted in the rural and urban aesthetic of the Northwest. The 13-person team includes Principal Geoff Prentiss, who received his Master of Architecture from the University of Washington, Principal Dan Wickline, who earned his Master of Architecture from the University of California, Los Angeles and Principal Tom Lenchek, who was with Balance Associates from their inception, before joining Geoff and Dan to form Prentiss + Balance + Wickline. The firm has received the NWAIA Citation Award, the Builder’s Choice and Custom Home Design Merit Award, the NWAIA Honor Award, the AIA Spokane Craftsmanship Award, the Futureshack Award, and the AIA Home of the Month award, to name a few. They’ve also been featured in Mountain Living Magazine and Northwest Home Magazine, and most recently in Dwell, Luxe, and Seattle magazines. The Garden House is a feat of creative design and magnificent artistry. It was recognized by The Seattle Times and Dream Homes Pacific Northwest, and it’s not hard to see why. The curved roof gives an ample and visually appealing room height, while the wood paneled ceiling contrasted against black iron fixtures cries industrial, cabin chic. Handsomely carved beams, bathroom skylights, and walls of windows cultivate an unbeatable, light-filled retreat. The Capitol Hill residence showcases the firm’s capacity to execute sustainable architectural principles alongside cutting-edge form. The rainwater from the roof collects into a steel entry water feature; a central translucent slot allows daylight to reach deep into the home; exterior, mounted mechanical shades keep things cool without losing the view; and a 30-panel photovoltaic system on the roof funnels electricity back into the grid. This home was honored in Luxe Interiors + Design for Sustainable Architecture. Other unique features include a long, rectangular cement fireplace, a glass paned railing, and a frosted glass entryway. Founded by Shannon and Kyle Gaffney and Brian Collins-Friedrichs in 1999, SkB is a full-service architectural and interior design firm with a staff of 40 and a commitment to creating flexible, beautiful, and high-performance environments. Shannon Gaffney works on a versatile array of projects, including mixed-use, retail, residential, office, and restaurant. Kyle Gaffney prides himself on crafting structures that are cost and resource conscious and is primarily responsible for SkB’s residential home practice. Brian Collins-Friedrichs brings over 30 years of experience to his work, with an expertise at balancing creativity and technical prowess. SkB was a finalist for the 2017 Architizer Award and the 2016 Mixed Use Development of the Year Award. 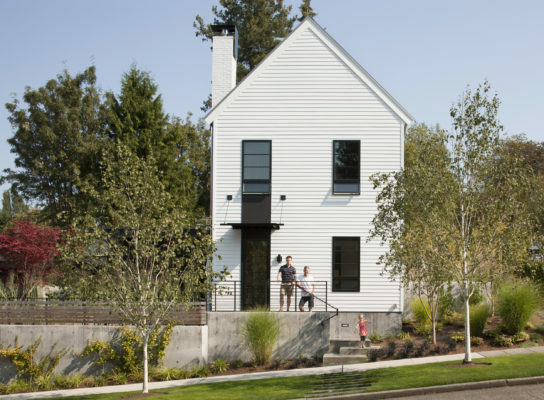 The firm also received the 2015 AIA People’s Choice Award in Urban Design 400 Fairview, the RealNetworks Seattle Local Architect National Merit Award, and the 2013 International Design Award for the Bel Henry Residence. Their work has been featured in Interior Design Magazine, Portrait of Seattle, Luminous Spec, Dwell, and Simple Sanctuary. The ToDD residence is a 1,971-square-foot house that is the quintessential representation of urban farmhouse charm. Adhering to a very restricted footprint while capitalizing on the usable space, this modestly sized house is created from two structures. A two-story structure houses the living, eating, and sleeping spaces, while another single-story structure contains the home office and guest spaces. An outdoor terrace links the two. The charm is amplified by the stylish galley kitchen, the outdoor fireplace, and the exposed second-floor landing. The Bell Henry home is an ode to a residential art gallery — a Mid-century modern home that contrasts organic and inorganic materials to cultivate simple grace and natural appeal while celebrating the client’s fantastic art collection. Special details include ebony and steel floors, a beeswax wall that hides the staircase and becomes a backdrop for sculptural art, granite countertops, an elegant outdoor pool, and a gorgeous, freestanding bathtub with an adjacent wooden ladder to assist with entry. Allied8 Architecture is dedicated to being inclusive of creative ideas and minimizing project waste so that each project is considerate to its surrounding area. The firm’s of seven include Partners Leah Martin and Barbara Busetti. Their work has been the cover feature in Northwest Home, and has also been featured in Design Bureau, the Indian Tribune, Well Done Blog, Seattle Magazine, The Seattle Times, and on HGTV. Leah Martin has also been a keynote speaker for Expand Your Horizons. Martin describes her ideal client as someone who is willing to think outside of the preconceptions they may have had about their home, while also bringing an enthusiasm for the design process. The Juanita Residence was a gorgeous success after three-year process of solving problems with land issues. This home is meant to take advantage of its sloped hillside lookout, capitalizing on Pacific Northwest views and inviting ample natural light. Special touches include exposed beam outdoor overhangs, stairwell skylights, exterior wood paneling and upper patio, and a fantastic montage of interior textures and materials that feels both contemporary and classic. A handsome residence in West Seattle pays homage to the beauty and simplicity of passive design with 12-foot overhangs, while simultaneously offering urban forest potential with well-crafted outdoor space, including raised beds and an upper floor ladder that leads to the roof. The boxy nature of the design envelope is softened by wood details and large, well-positioned windows. Board and Vellum represents a trifecta of design expertise, including architecture, interior design, and landscapes. They feel as comfortable with a new, modern home as they do with a historic residence in need of some serious creative remodeling. AIA member and principal architect Jeff Pelletier began living his lifelong dream of being an architect after receiving his degree from Cornell University’s architecture program. He founded Board and Vellum in 2011, bringing his professional experience in residential, retail, commercial, and multi-family projects into his new vision. Now with a staff of over 20 people, Board and Vellum is growing their notable presence in Seattle. Pelletier was recognized with Puget Sound Business Journal’s “40 Under 40” award, and Seattle Business Magazine featured the firm as one of Washington’s 100 Best Companies to Work For in 2017. A space-expanding remodel on a Tudor-style Seattle home allowed Board and Vellum to flex their capacity for a design that maximizes the good in an existing structure. The resulting remodel and expansion of the residence transformed a two-bedroom, one-bath into a three-bedroom, two-bath home. New and revised roofing structures was Board and Vellum’s way in, which included flipping the direction of the gable roof and extending the existing gable roof. The second level was enhanced to provide two children’s bedrooms, which have a view of the backyard and a half bath. This stunning interior character of this home is enhanced with reclaimed wood details and avant garde contemporary light fixtures. Board and Vellum had their work cut out for them when they turned an old brick home in the Magnolia neighborhood into a vibrant, spacious, bright and modern residence. Opening up the previously enclosed staircase and the walls — and installing new folding glass doors, extra storage space, and a window seat — created comfort, ease, and flow between spaces. The wood benched breakfast nook, quartz countertops, white subway tile, beautiful hanging fixtures, and refinished basement are all simply icing on the cake.